Most of us dream of the day we can retire and be free from the daily grind. Retirement offers us the opportunity to remake our lives and often we can choose to live almost anywhere. In years past that often meant moving to a a warmer climate like Florida or Arizona. One of the major considerations when choosing to relocate (whether for retirement or for a job) is the cost of living. Will your pension (or paycheck) cover your daily expenses? And that’s where our Cost of Living Calculator comes in handy. It allows you to choose your starting location and your proposed destination and get a comparison between the two. For instance, suppose you are tired of the cold in Albany, N.Y. and would like to retire in Florida. You would simply pull down the list of cities in the “moving from” box and scroll down to New York and then choose from the list of cities in New York. Unfortunately not all the cities are listed but you should be able to get a close approximation. Next you would pull down the “Moving to” list and choose one of the cities in Florida. If you are moving for a job you can also fill in the “Job Title” and “Salary” fields (but it isn’t required). If you choose to use these fields, the calculator will also tell you how salaries compare in addition to the cost of living. 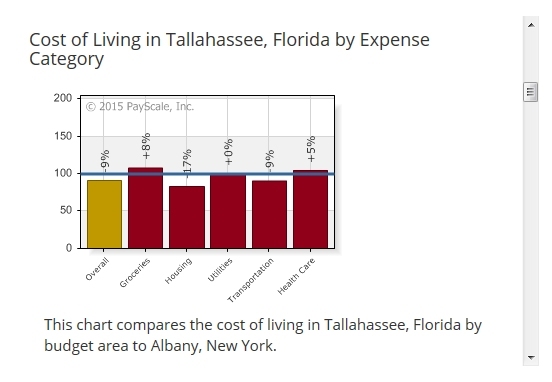 The Blue line represents the cost of living in Albany and as we can see, as of this writing, Groceries and healthcare are actually more expensive in Tallahassee than Albany but overall Tallahassee is 9% cheaper than Albany. 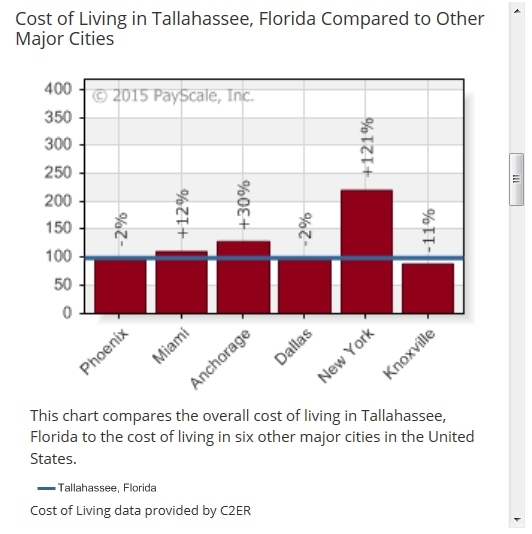 If you continue scrolling down you will see the cost of living in Tallahassee compared to other cities in the U.S. From the chart we can see that Tallahassee is pretty comparable to Phoenix and Dallas, 12% less than Miami, 30% less than Anchorage but 11% more than Knoxville. The big difference however is compared to New York City which costs a whopping 121% more than Tallahassee. So by moving from NYC you could easily cut your expenses by more than half. If you are retiring and have the luxury of choosing a city in addition to choosing the state you certainly want to compare the various cities within the state because there can be quite a variation between cities even in the same state. For instance we compared the available cities in Florida with Tallahassee. If we set Tallahassee equal to 100% we see that there are several cities on the Atlantic coast that are 5% cheaper and Tampa is actually 6% cheaper than Tallahassee but there is also Fort Lauderdale which is 15% more expensive so the total range from Tampa to Fort Lauderdale is 21% difference.